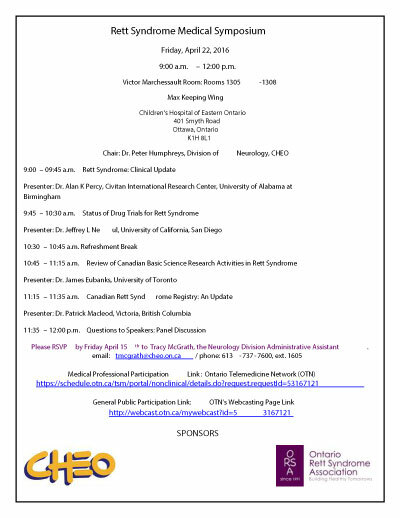 Medical Symposium | Ontario Rett Syndrome Association | O.R.S.A. The Ontario Rett Syndrome Association is dedicated to continued medical and public education on Rett syndrome. On Friday, April 22nd, 2016 a medical symposium is being held at the Children’s Hospital of Eastern Ontario from 9:00 a.m. to 12:00 p.m. The leading physicians and researchers in the field of Rett syndrome will be speaking. Medical professionals may participate by attending the symposium or by linking in via Ontario Telemedicine Network (OTN). The general public is able to participate by using the OTN public webinar link. Families are encouraged to share this information with their child’s health care and educational teams. Information regarding the special links can be viewed on the symposium poster. Together we are building a healthier tomorrow for all those courageously living with Rett syndrome. For futher information please email 2016Conference@rett.ca. Watch the Medical Symposium Here.